Pets need to be vaccinated to prevent against rabies. Rabies is a fatal viral zoonosis and veterinarians believe that all mammals are susceptible to it. This disease puts the public at risk and prevention measures are urged. Rabies is transmitted through saliva. It enters the body of person or pet through an opening in the skin, typically a bite wound. Other openings in the skin, for example, burns, scratches, ulcerations, scrapes and unhealed surgical incisions provide opportunity for the rabies virus to enter your pet's body. Rabies is a disease that is acute. It creates progressive inflammation of the brain in an animal that has been infected. Veterinary research has identified that rabies disease is caused by a lyssavirus and that it is the most important lyssavirus throughout the world. Wild animals living near your home may be infected with the lyssavirus that causes rabies when pets are bitten. The likely animals in your area probably include skunks, foxes, bats and raccoons. You'll want to discuss your pet's yard and neighborhood environment with your veterinarian to ensure your pet's safety. Prevention recommendations for pets outlined in the Compendium of Animal Rabies Prevention and Control, 2011, indicate that "Regardless of the age of the animal at initial vaccination, a booster vaccination should be administered 1 year later." Prevention measures mean that exposure to humans and animals can be reduced or eliminated by becoming aware about the disease and how it is transmitted. Prevention also includes eliminating contact with wild animals. Treatment plans recommended by your pet's veterinarian should be followed and completed. The Compendium advises, "The virus is usually transmitted from animal to animal through bites. The incubation period is highly variable. In domestic animals, it is generally 3 to 12 weeks but can range from several days to months, rarely exceeding 6 months." You will want to alert your veterinarian at any time you suspect your pet has been bitten or received saliva from an animal that could be carrying the virus. The varying incubation period will require that you keep close watch on your pet when exposure is suspected. "Rabies is rare in vaccinated animals," advises the Compendium. "Dogs, cats, and ferrets: Rabies virus is excreted in the saliva of infected dogs, cats, and ferrets during illness or for only a few days before illness or death." The salivary glands are the virus's favorite concentration site. Damage to muscles that involve swallowing and drinking are severely affected by the virus. The rabies virus and resulting disease is preventable. Mad Dogs and Meerkats: A History of Resurgent Rabies in South Africa, suggests that this disease kills 55,000 people around the world every year. "Responding quickly when one is bitten, is critical - if you wait for the symptoms to show it is often too late. Post-exposure treatment saves the lives of around 15 million people around the world every year." Education and awareness about the virus are urged during World Rabies Day every year. Is my pet vaccinated against the rabies virus? How would I know if my pet was infected with the disease? What should I look for if I suspect my pet has been infected? 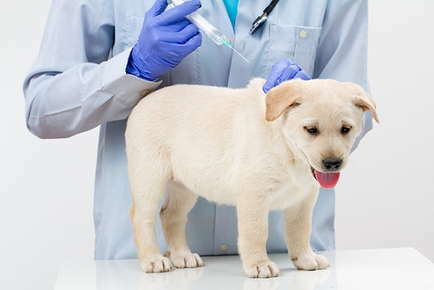 Can my pet receive a vaccination after it has been exposed to the virus? Is vaccination after exposure effective? What is the wait time after exposure? Are there animals known in our neighborhood to be carrying the rabies virus?